Browse: Home / Instarecon – Basic automated digital reconnaissance. Instarecon – Basic automated digital reconnaissance. Host represents an entity on the internet. Can originate from a domain or from an IP. Basic DNS lookups on self. Returns self. 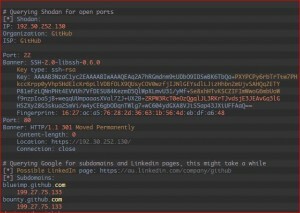 Google queries to find related subdomains and linkedin pages. since each top-level domain has a way of representing data. This makes it hard to index it, almost a project on its on. Saved in each ip.whois_ip as dict, since this is how it is returned by ipwhois library. #If cidr is already in Host, we won't get_whois_ip again. 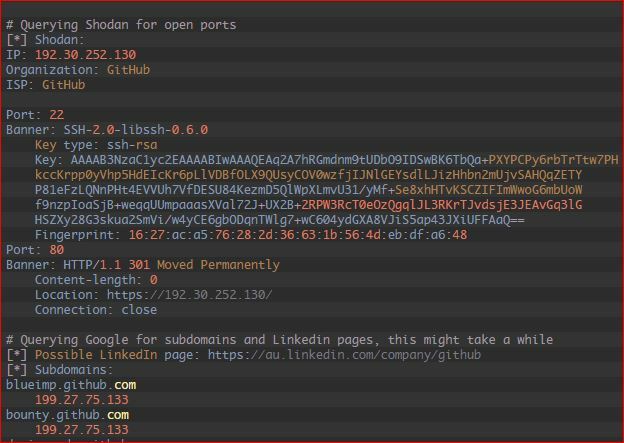 Shodan lookups for each ip within self.ips. Saved in ip.shodan as dict. Does direct DNS lookup to get IPs from self.domains. """Generator that yields each IP within self.ips as a csv line.""" This method does all possible direct lookups for a Host. Not called by any Host or Scan function, only here for testing purposes. Subclass of Host that represents an IP network to be scanned. """Overrides method from Host. Yields each Host in related_hosts as csv line"""
as a domain can resolve to multiple IPs. feedback -- Bool flag for output printing. Static variable. versobe -- Bool flag for verbose output printing. Static variable. 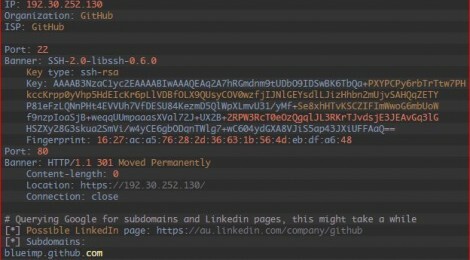 For this, it parses user_supplied strings to separate IPs, Domains, and Networks. #Test if user_supplied is an IP? #Test if user_supplied is a valid network range? #Test if user_supplied is a valid DNS? """Does reverse dns lookups on a network object"""
← sCap – Network Sniffer (Scan and Capture Incoming Packets).